By Jason Price 12 Comments - The content of this website often contains affiliate links and I may be compensated if you buy through those links (at no cost to you!). Learn more about how we make money. Last edited March 16, 2015 . With all the focus on Thanksgiving, Black Friday shopping and Christmas time, you may have not yet thought about planning goals for next year. Is it too early and are you too busy to think about the subject of goal setting right now? Or perhaps you’ve never really invested much time in goal setting. Either way, the next next holiday focus (after all of the above) will be New Year’s, so when is it going to be the right time to think about the things you’re going to do next year to achieve personal finance goals, but also in other important areas of life? As soon as fall arrives our focus is on getting ready for the holidays, but without forethought into the turn of the New Year, we might find ourselves a few months into it finally getting serious about goals. By that time, we’ve lost weeks, maybe months. Sure, it’s easy for everyone to name a New Year’s resolution on January 1st, but I’m talking about serious goal planning. The kind that pays off debt, builds emergency funds and even grows your faith! As many companies are planning for next year at this time, it’s also the perfect time to put together your plan. It will be fresh and ready as the clock strikes midnight New Year’s Eve. You won’t regret it and you’ll be ready to make next year one of the best. If you have or haven’t set goals before, this post is for you. When I think about setting goals there are a few things that help me. Identify life values before setting goals. What are the most important areas in your life? These can be broad areas such as your faith, family, friends, financial security, health, etc. Just write them in a list. If you’re married, involve your spouse. Look at the Crown Money Map or Dave Ramsey’s Baby Steps (whatever your preference) and identify where you are on your personal finance journey. For example, if you’re trying to pay off credit card debt, write down that goal and perhaps the next two you find on either plan so that you have a starting point. When you begin to write your goals consider using the SMART goal format. Have you ever heard of SMART goal planning? SMART goals are Specific, Measurable, Attainable, Realistic and Timely. 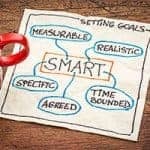 Google “SMART goals” to find more information. Note: don’t go too overboard with trying to get your goals in this format. I recommend using it as a guideline, but don’t let it prevent you from getting something down on paper. I read a devotional called “Understanding Financial Stewardship” several years ago by Charles Stanley. In the devotional Stanley suggests creating a “Prosperity Wheel” in which you identify goals within key areas of your life. Here’s how to create it. Start off by drawing a large circle on a piece of paper. Draw a smaller circle in the middle of the larger circle and write God in the center of the smaller circle. As a Christian, God should be involved in all areas of life. Stanley suggests drawing cross hairs from the smaller circle to the larger creating 4 quadrants. 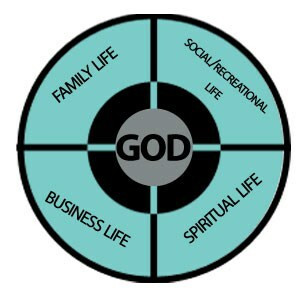 You should label them Business Life, Social/Recreational Life, Family Life and Spiritual Life. However, I have found it helpful to expand these life areas to represent all your life values. Once you have your sections defined, simpley create the goals within each section (try the SMART format as a guideline). Our family has used this approach a number of times and it’s worked quite well. Note: I think keeping your list of goals to 2-3 per life value maximum is important to make sure you can achieve them all. Or, if you’re new to goal planning you might start of f by identifying one goal per life value. Stanley says the benefits of the wheel are the following and I agree! It will remind you continually to keep God at the center of your desires. It’s likely to compel you to adjust your priorities in life. It allows you to take a look at your total life at a glance. I particularly like the benefit of priorities. If you see that you have more goals under certain values, it may be clear you value those areas more. For example, if you have more work goals than family or faith, you may be out of balance. Now is the time to set the course for next year! Involve your spouse and family in the goal setting exercise. If you’re setting goals for your family, you can have them create a set of values and goals for themselves and combine them all together in one family Prosperity Wheel. The wheel also provides a way to stay motivated and encouraged towards your goals. Once created, hang it in a common area of the house to reflect upon daily. Good luck! Do you have any tips to help readers get focused on goal setting now even though it's a busy time of year? Or, care to throw out one of your goals as an example to others? Let us know in the comments. Great post! NOW is the time to begin thinking about our goals. I started this month and I would suggest that individuals start with their budget for the year. Most of our stress comes from finance so we must be proactive in setting the goals early. I personally took all of the finance blogs, books and common sense I had and mixed it into one plan. I made a decision to eliminate my cc debt in 2009 and my car debt in 2010 while increasing my savings. Tina, great advice. Another component of setting goals is orienting your spending plan towards them. For example, if you plan to pay off cc debt, you’ll want to lock in the additional amount you plan to pay towards this debt in your monthly plan. Good luck with your goals! Interesting take on Fall as a time for goalsetting. An article in the Wall Street Journal some years back identifed Labor Day as the real start of the new year–the business new year basically. But the point being that the world slows down in the summer, providing a natural break, and when it ends we’re entering into a new annual cycle. New Years Day, it said, is a formality mostly ignored and meaningless, mostly marking the end of the holiday season than anything else. I think SMART goals are the way to go. I am starting to put mine together and publishing them right now for the upcoming year. Covey said, “Begin with the end in mind.” Goals are the only way to make progress in life financially or otherwise. I’m a strong believer in having a value-based purpose from which spawn value-based goals. Great article! Thanks for the comment, Jeff. I had not heard that quote before, but that makes sense. You have to know your objective before you can plan your way. When I set my financial goals, I always make sure I do a follow-up on a quarterly basis. Having goals is one thing, but following them improve your chances to succeed. – what has been done to achieve my goal? – what can be done to make it happen? this is almost like doing a job evaluation but it helps me to continue on the right path! Mike @ Gather Little by Little´s last post ..Insider trading and why you must avoid it! Mike, this is really good advice. I should have mentioned something about follow up in the article, but you covered it well here. I think once your questions are asked we can adjust our plans based on the answers. As a project manager, I know my original plan often changes given different circumstances. 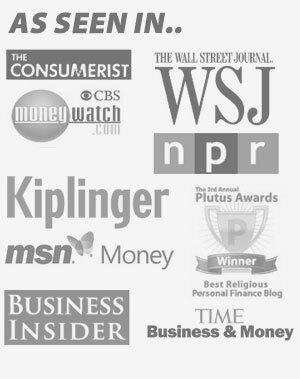 Part of being a good money manager requires adjusting our financial plans when needed as well. Great point! I never try to do any goal-setting near the New Year. I think you are setting yourelf up for failure. You should not set goals based on the calendar, your motivation for doing so should be to improve yourself as a person in some way–not because of some “New Year’s resolution”. Additionally, any goal that is God-centered or tied in with your particular religion has a built in increased chance for success. I really like that you mention evaluating your life values. I really believe that when you focus on what you’re passionate about and put your energy in the things that excite you – there’s no telling what you’ll be able to accomplish! Our ongoing goal of getting debt free will remain for 2010. I haven’t ever thought about the ‘life value’ thing. I’ll have to look at that some more – good idea. I also want to be a good husband to wife and father to my children. 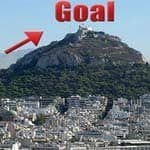 You are right about using the SMART goal setting tool! I like using Actionable better than Achievable, but in essence, SMART is the way to go! Previous Post: More Vs. Less: Which Is Better?